You can actually see fleas racing along the surface of a dog’s skin. They dislike light, so the best chance for seeing them is on your dog’s belly or inner thighs or deep within the fur. Look for dark, copper-colored specks about the size of a pinhead. Using a flea comb can help lift them out of your dog’s coat. Another sign are flea eggs — white, oval, salt-like dots found in your dog’s fur. These small brown insects have strong back legs that allow them to jump from animal to animal or from grass to an animal. Each insect lives about two weeks. Over the course of her lifetime, an adult female flea can leave behind several hundred eggs. Some will drop off into yards, gardens or sidewalks; others into bedding, carpet, furniture, the car or wherever else the dog spends time. The eggs hatch into worm-like larvae. They eat organic matter, skin scales and even blood-rich flea dirt. The larvae grow and then form a cocoon around themselves and become pupae. The cocoon protects the pupae from the environment, allowing them to wait for just the right temperature and host before hatching. Triggers for hatching include heat, vibrations and exhaled carbon dioxide — all signs of a nearby host. 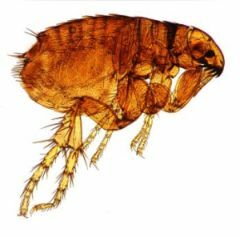 Controlling fleas requires doing battle on several fronts — taking care of the dog, controlling fleas in the house and controlling fleas in the yard or garden. Anti-flea products are powerful chemicals. They come with an environmental cost and, in some cases, health costs to human beings. Products to kill fleas work on different stages of the insects’ life cycles. Adulticides kill adult fleas, but leave eggs, larvae and pupae to develop into new fleas. Insect growth regulators (IGR) kill the eggs and larvae but leave the adult fleas. This can be a problem for allergic or sensitive dogs. These include pyriproxufen and methoprene. Insect development inhibitors (IDI) prevent flea larvae from moving into the pupae stage. An example of this type of flea-control product is Lufenuron. It prevents the larvae from developing a hard shell, which is essential for becoming a pupae and adult flea. The list of flea and tick products is nearly endless. Before using any anti-flea control, check it against the National Resources Defense Council’s Green Paws products list to see what you are really getting. Read directions carefully. Seek a veterinarian’s advice, especially if you want to use more than one flea product at a time on your dog. Among the most common flea treatments these days are spot-on products. They are applied to a single spot on the dog’s body and absorbed into their systems and distributed throughout the body. Examples include Frontline and Advantage. Frontline Plus (made by Merial) kills flea eggs, larvae and adults as well as ticks and chewing lice. Its active ingredients are fipronil and (S)-methoprene. It begins working four hours after application. Remember to wait at least 24-hours before bathing your dog or allowing it to swim or get wet. Advantage II (made by BayerDVM) also kills fleas at all life stages and lice. (Note that Advantage Topical Solution only kills adult fleas.) Its active ingredients are imidacloprid and pyriproxyfen. As with Frontline, you should wait at least 24-hours before bathing your dog or allowing it to swim or get wet. Flea shampoos, powders, sprays and collars can all help fight fleas but don’t last as long as the products above. Remember that applying these products exposes you to their dangers as you pet or play with your dog. The National Resources Defense Council reported that when an adult plays with a dog wearing a flea collar with propoxur or tetrachlorvinphos, they are potentially being exposed to up to 500 times the safe levels of the pesticide set by the EPA. For children the exposure level is up to 1,000 times the safe level. Look for products that contain Lufenuron, methoprene and pyriproxyfen, which are common and effective insect growth regulators. If there are other dogs or pets in the house, they too should be treated for fleas. If you have cats make certain that the flea or tick product is specifically designed for cats; dog products can be dangerous or even deadly to cats. Thoroughly vacuum the carpet and upholstery and throw the vacuum bag away. This may need to be done daily until the problem goes away. In severe cases, it may be necessary to steam clean the carpets to truly get rid of the fleas. Foggers with methoprene help kill fleas indoors. Both eggs and larvae can fall into cracks that foggers may not be able to effectively reach. Carpet treatments with sodium borate can help. Do not use these around cats as they can cause respiratory problems..
Commercial flea treatment by an exterminator. Thoroughly clean dog houses, dog house bedding, kennels or dog runs. An outdoor insect growth regulator such as pyriproxifen can be used. It’s more stable in sunshine and lasts longer outdoors than methoprene. A natural approach is to use a certain type of nematode, a tiny worm, that feed on flea larvae. The worms are spread around the yard, particularly in warm moist areas that the fleas frequent. Remember, the more time your dog spends outdoors or with other dogs, the greater its risk of getting fleas.